1. Lose weight – while you probably don’t want to make your home smaller (unless you are ready to downsize) you can make a commitment to slim down your living space. Winter is a great time to work on de-cluttering, especially with temperatures hovering in the single digits. Take this indoor time to go through closets, basements and garages to identify items that have been neglected and gathering dust for years. If you haven’t touched it in more than 12 months, you can probably live without it. As they say, “one man’s trash is another one’s treasure,” so make sure you donate, recycle or otherwise find an appropriate home for your unneeded items. 2. Stop procrastinating – When it comes to your home, procrastination can cost you dearly. That rotted window sill or missing shingle you have been putting off having repaired can lead to more expensive water damage, insect infestations and other unforeseen costs. Leaking faucets and running toilets can result in exorbitant water bills. You get the idea. This year make a commitment to conduct a thorough inspection of your home each quarter and then act on any issues you might find. 3. Become more efficient – The long winter days also offer a perfect opportunity to conduct an informal energy audit of your home with an eye to improving efficiency and saving on energy costs in the new year. Are you using the latest LED lighting, particularly in the high-use areas of your home? Do you have a programmable or other smart thermostat so that you optimize your heat and AC usage? Are your furnace, water heater or refrigerator significantly outdated and therefore extremely inefficient? Do you feel cold air streaming in from around windows and doors? By answering these questions you can start putting together a plan to improve your energy efficiency significantly. 4. Pamper yourself (actually, your home) – Life should not be all work with no reward. Too often homeowners deal with maintenance and repairs but wait until putting their homes on the market before making long-desired improvements. Make a commitment this year to make your home the way you want it – today! Whether that means adding a fresh coat of paint or renovating a bathroom, you will be amazed at how relatively minor improvements can enhance your enjoyment of your home. 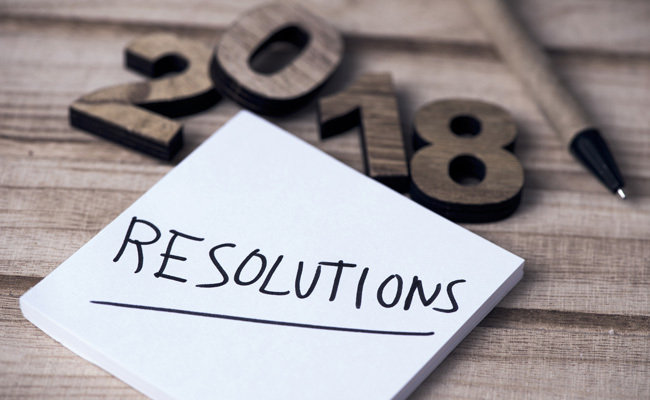 Feel free to make your own home resolutions, but make sure you stick with them. Your home is not only your most valuable investment; it is also where you spend most of your time. Happy New Year to you and your home! For some additional ideas, videos and information on seasonal home maintenance tasks, visit our Seasonal Maintenance page.